and racial discrimination in Japan. Fabricates information to make his point, then refuses to retract or correct his assertions. Information site here with full details on misquotes from a 2000 USA Today article, with requests for correction by article's author, reporter Peter Hadfield. (Nutshell: High Court affirms just about everyhing the District Court ruled in 2002. A group of volunteer Lawyers, Advisors, and Supporters from around the world. in what is probably Japan's first class-action-type lawsuit on behalf of non-Japanese and racially-diverse Japanese. Please help out if you can. April 7, 2005: Japanese Supreme Court refuses to hear the case. Thus the Otaru Onsens Lawsuit is over. Claims Plaintiffs were just out to get them. Continues to this day to refuse entry to "foreigners who cannot speak Japanese". Represented by Lawyer Itou Hideko, same as before. The Yunohana section of the Lawsuit ends here. 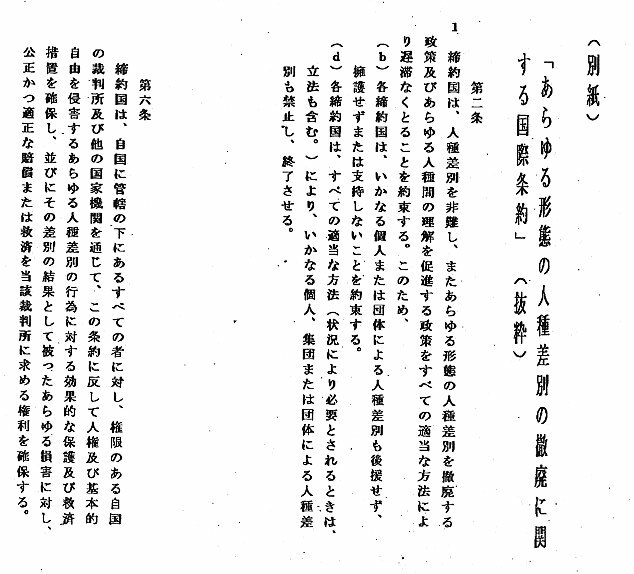 and other documents submitted as evidence to the Court in Japanese. PLAINTIFF ARUDOU DEBITO DECIDES TO APPEAL AGAINST OTARU CITY. getting a court order to avoid paying Plaintiffs any damages until the decision comes down next time around (which may take years). "JAPANESE ONLY" signs, barring entry to people (including citizens) who look foreign, have been up in businesses (public bathhouses, restaurants, karaoke parlors, ramen shops, bars, pachinko parlors, discos, etc) have been up continuously in Japan since at least 1993, with more being found to the present day. Japan effected the UN Convention against Racial Discrimination (CERD) in 1996, where it promised to take all effective measures to eliminate all forms of racial discrimination "without delay". This includes enacting anti-discrimination legislation. However, Japan is still the only developed country without any form of law banning racial discrimination (which also violates Article 14 of the Japanese Constitution). The Ana Bortz Decision of 1999, where a Brazilian was ejected from a jewelry store merely for being foreign, ruled that foreigners are protected by both the Japanese Constitution and international treaty (specifically the CERD) in the absence of domestic laws. 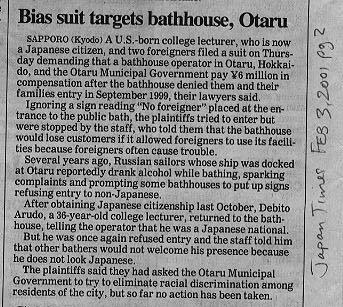 CASE IN POINT: From 1993 until 2001, tourist city Otaru, on the northern Japanese island of Hokkaido, had at least three public-access bathhouses banning entry to all "foreigners". This included tourists, foreign residents, bilinguals, naturalized Japanese citizens, and even interracial Japanese children who looked too foreign. Over a year of negotiations with every party to the dispute to get all of these signs down proved fruitless, as local government authorities justified nonintervention on technicalities, and the businesses claimed cultural differences and certain bankruptcy if foreign customers drove away their allegedly xenophobic Japanese clientele. Result: Emboldened by the success of Otaru's xenophobes, copycat businesses nationwide put up their own "Japanese Only" signs. See photos of signs from at least eleven cities here. 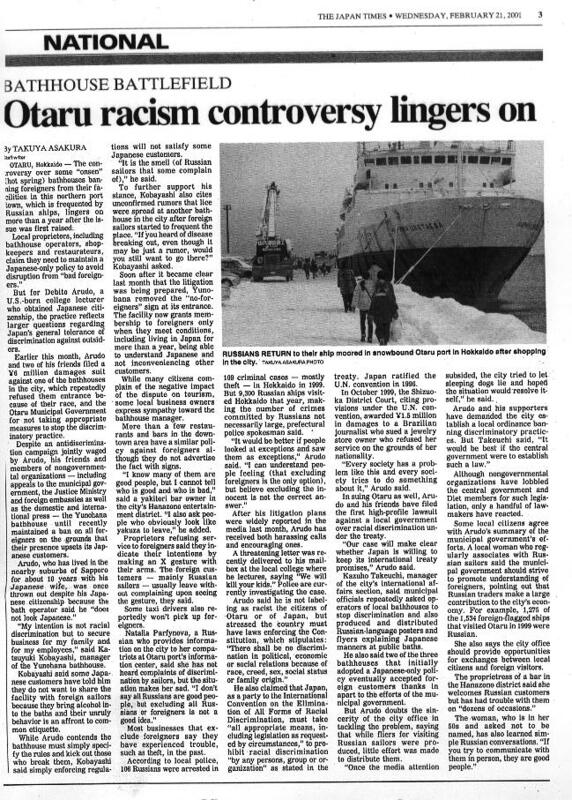 Feb 2001: Three people excluded-- naturalized Japanese citizen Arudou Debito, German Olaf Karthaus and American Ken Sutherland --took one Otaru onsen (hot spring) and the City of Otaru to court for, respectively, racial discrimination, and negligence under the Constitution and UN treaty. 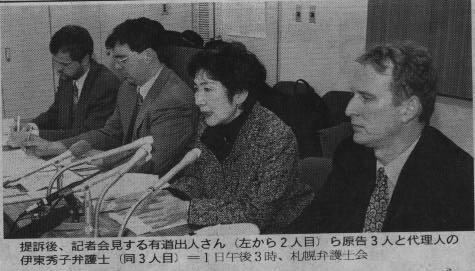 Nov 2002: The Sapporo's District Court's ruling held Onsen Yunohana culpable, ordering restitution to the three plaintiffs of 1 million yen each. However, the Court ruled that the illegal activity was not racial discrimination per se, but "unrational discrimination", i.e. "discriminating too much", thus avoiding clear litmus tests for future lawsuits. This legal reasoning has been ruled invalid repeatedly by the United Nations. Sapporo District Court also ruled that Otaru City was not liable for failing to pass laws against years of racial discrimination in its jurisdiction, as there is no law in specific (aside from UN Treaty) which requires legal infrastructure to protect human rights. Plaintiff Arudou Debito appealed the City's ruling in Nov 2002. Sept 2004: The Sapporo High Court will hand down its decision (and that of the Onsen Yunohana Appeal) on Sept 16, 2004, 1:10PM. If Plaintiff Arudou Debito loses his appeal against Otaru City, he will take the case to the Japan Supreme Court. Losing there, he will take the case to the United Nations (where Japan claims the CERD covers nobody in Japan because Japan has no citizen racial minorities). There's a whole book written on this issue, information here, but read on directly below for more details on the background of the case... or click here for a 2002 essay on WHY THIS CASE MATTERS. In sum: The Otaru Onsens Lawsuit is a test case of Japan's commitment to being a member of the international community, keeping its promises in an era of globalization and immigration, and enforcing international standards of human rights. It cannot just sign treaties, so that it can ask for a seat on the UN Security Council, without being expected to follow them. 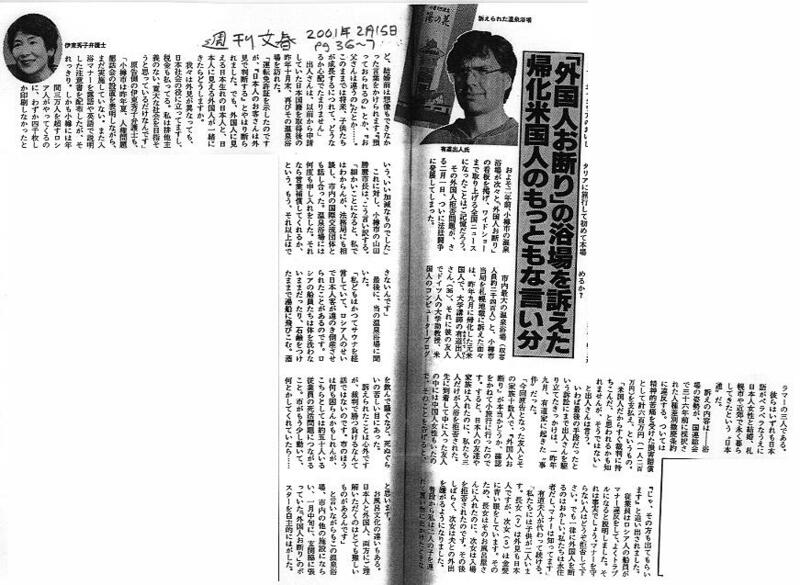 Full text of Sept 16 2004 High Court Decision available here in Japanese. 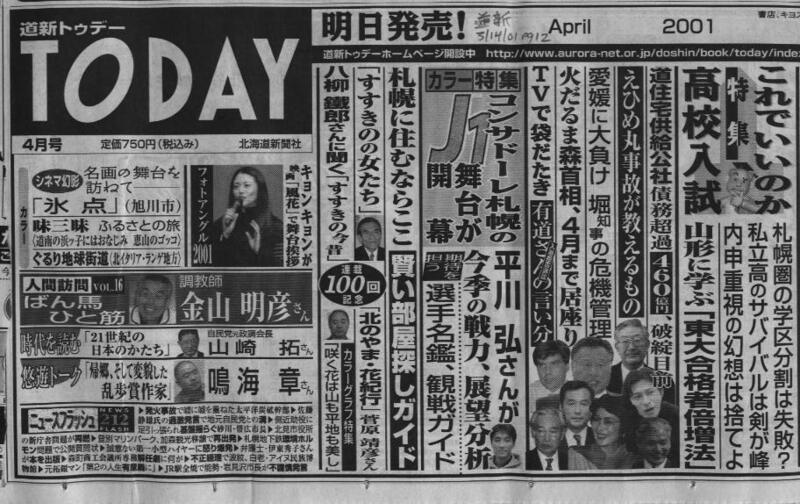 April 7, 2005: Japan's Supreme Court refuses to hear the case, after only two months of deliberation. Information site here. Next step, the United Nations (which will not hear cases until all domestic avenues are exhausted--which they now are) and a new lawsuit against the national (as opposed to a local) government. Contributions you can make--support THE OTARU CITY RACIAL DISCRIMINATION "LAWSUIT BENGODAN" (LEGAL TEAM) and SUBMIT YOUR EXPERIENCES OF REFUSALS ON THE BASIS OF RACE OR NATIONALITY TO THE SAPPORO HIGH COURT, in what is probably Japan's first class-action lawsuit on behalf of non-Japanese and racially-diverse Japanese. Please help out if you can. THE ROGUES' GALLERY--names, photographs, and contact details of businesses which refuse service to "foreigners" with JAPANESE ONLY signs. We maintain in our lawsuit that places like these have been emboldened by Otaru's decade of negligence--i.e. businesses put signs up because they can. Japan has no legal sanctions against this, and Otaru proved it. 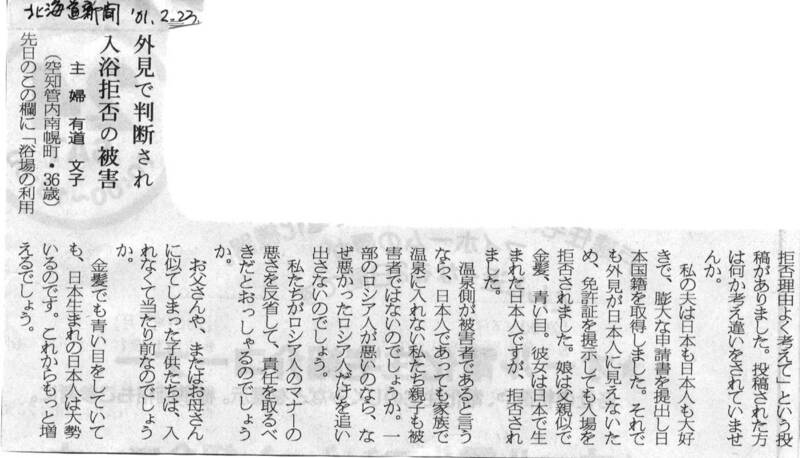 "Japanese Only--The Otaru Onsen Refusals and Racial Discrimination in Japan" by Arudou Debito. 274 Pages. Published By Akashi Shoten KK. Japanese version on sale now. English version on sale October 2004. See more here. Plaintiff Arudou Debito's tape-recorded refusal at Defendant Yunohana Onsen Oct 31, 2000, 5:45pm. He was refused entry despite showing proof of Japanese citizen because he still looked like a foreigner, which would allegedly cause the regular Japanese customers to stop patronizing the premises. Original Japanese transcript of these taped proceedings here. English translation and Romajinized Japanese version here Listen to it yourself in Japanese (on free downloadable Real Player) by clicking here. The basis of our case: Article 14 of the Japanese Constitution, and The UN Convention on the Elimination of All Forms of Racial Discrimination. FIRST COURT HEARING (Koutou Benron), March 26, 1:30 PM: Sapporo District Court. Plaintiffs read statements (chinjutsusho) outlining their motives and positions to the court. Read our first REPORT on this event in English here, and our court statements in Japanese and English here. Article from Kyodo Wire Service in Japanese here. SEVENTH COURT HEARING, March 11, 2002. Plaintiffs testify orally in court. Click here to see what was said. COURT-MANDATED SETTLEMENT MEETINGS, May 15 and June 11, 2002, which end with both Plaintiffs and Defendants refusing to settle out of court due to terms drawn up by the Sapporo District Court. Read more here. FINAL ARGUMENTS from both Plaintiffs and Defendants. 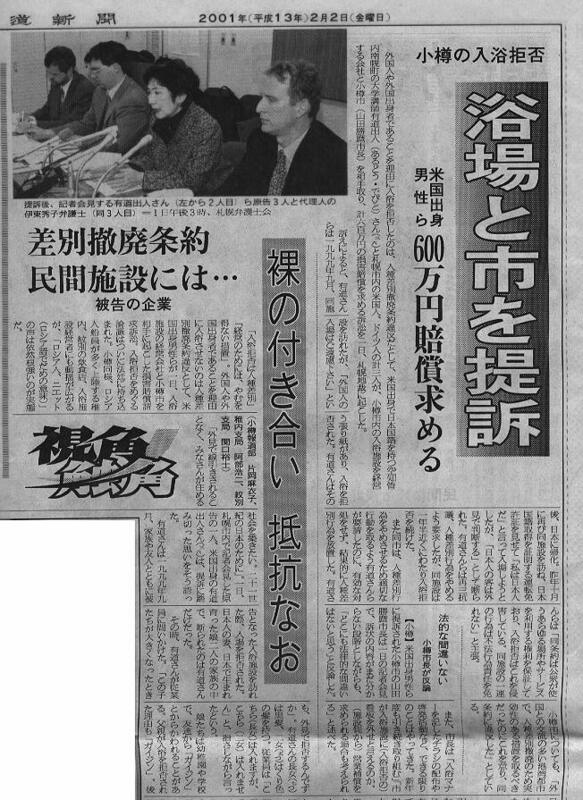 The formation of the THE OTARU CITY RACIAL DISCRIMINATION "LAWSUIT BENGODAN" (LEGAL TEAM). Join us if you like. OTARU APPEALS HEARING TWO (Sept 4, 2003) Info site here. Defendant Onsen Yunohana's non-stance (not even a mention of the problem at its rich-looking website--in Japanese Only, of course--at its own domain name, www.yunohana.org). As you can see by the photo there: it is no tiny "mom & pop" place, and it clearly has profited from all the publicity. It is in fact the biggest bathhouse in Otaru by volume, opening up a new branch in Asari when many other baths are closing in Hokkaido. 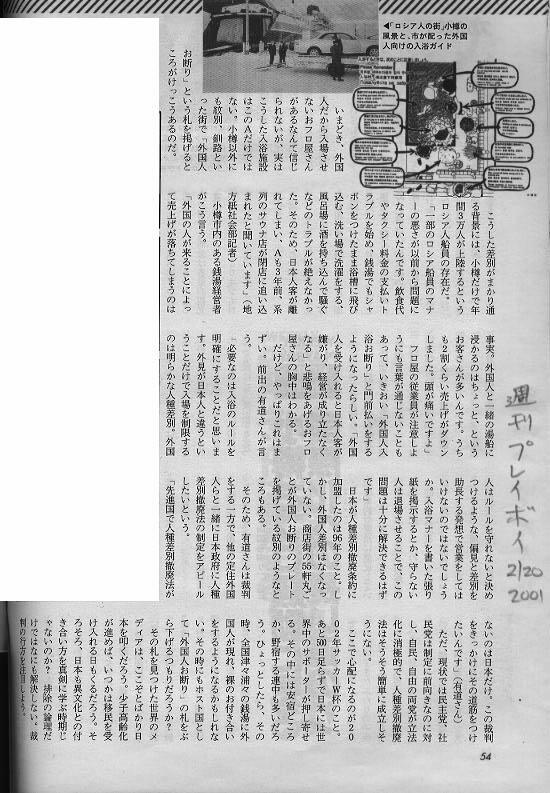 Also, see their angry petition for customer support (distributed around Feb 2001, and soon abandoned) in Japanese Only. UNITED NATIONS UNIVERSITY retracts invitation, denies Plaintiff Arudou his right to speak at their human rights forum ostensibly because he is in a lawsuit, but actually due to financial pressure from the Hokkaido Government et. al. 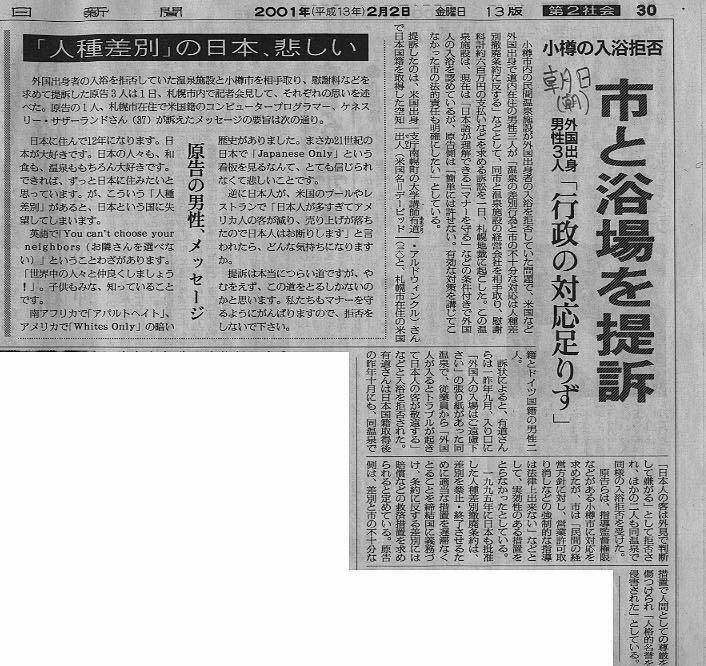 HAMAMATSU CITY proposes reforms to national government in Nov 2001 to help ameliorate discrimination and assimilation difficulties for foreigners. If Hamamatsu can take positive measures, why can't Otaru? This is a photo taken at our Feb 1 Press Conference, 3PM, at the Sapporo Bengoshikai, shortly after we submitted our suit papers to the Sapporo District Court. Seated from left to right are Plaintiff Olaf Karthaus (37, German nationality), Plaintiff Arudou Debito (ne Dave Aldwinckle, 36, Japanese nationality), our Lawyer Itou Hideko, and Plaintiff Ken Sutherland (37, American nationality). It's a long story. But click here to get a QUICK LOWDOWN on why we are suing in a Feb 5, 2001 essay written by Plaintiff Arudou Debito. 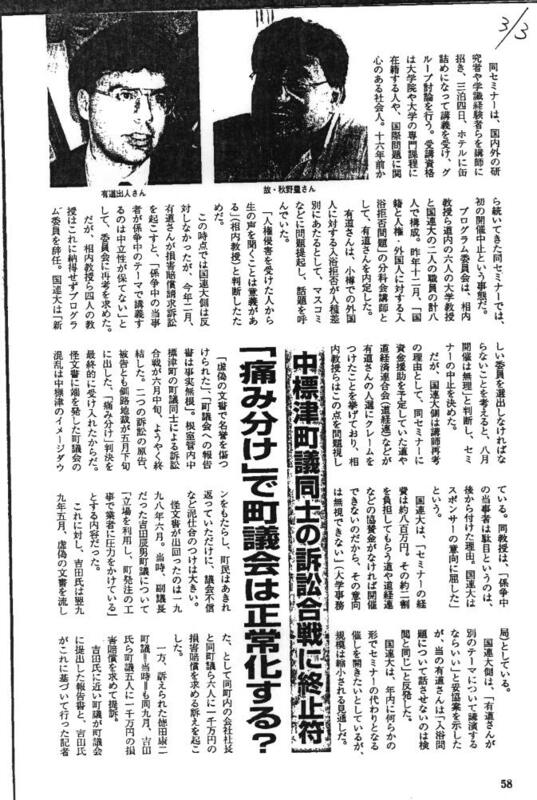 Here is a statement in Japanese and English from Plaintiff Ken Sutherland on the case, presented at the Feb 1, 2001 Press Conference and reprinted in full in the Asahi Shinbun, Feb 2, 2001. Recent developments can be found by clicking and paging down. And other background, so you can come up to speed, can be found by paging back up to the Facts of the Case section. is, in brief, Article 14 of the Japanese Constitution: equal protection before the laws for all citizens/residents (including foreigners, the Japanese government has confirmed). Denying a citizen entry into a public-use facility for no reason but physical appearance is indubitably unconstitutional. There is of course more to it than this. 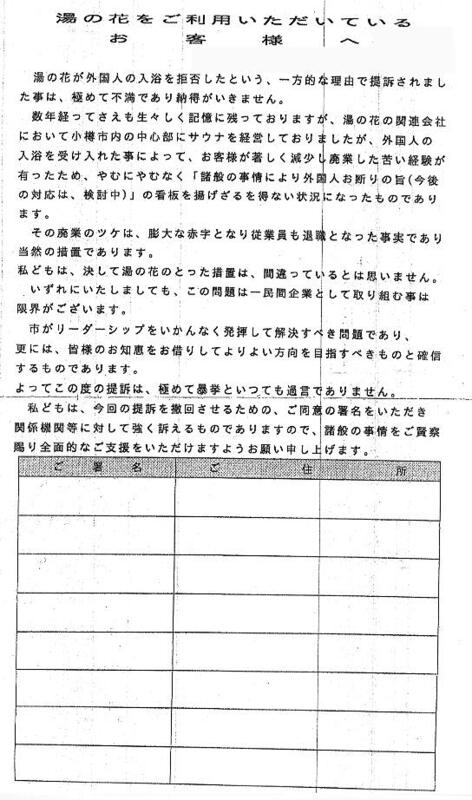 You are also welcome to look at the text of the Lawsuit Document (Sojou) we submitted to the Sapporo District Court, where we are, literally, making our case. It is, however, only in Japanese. Click here. 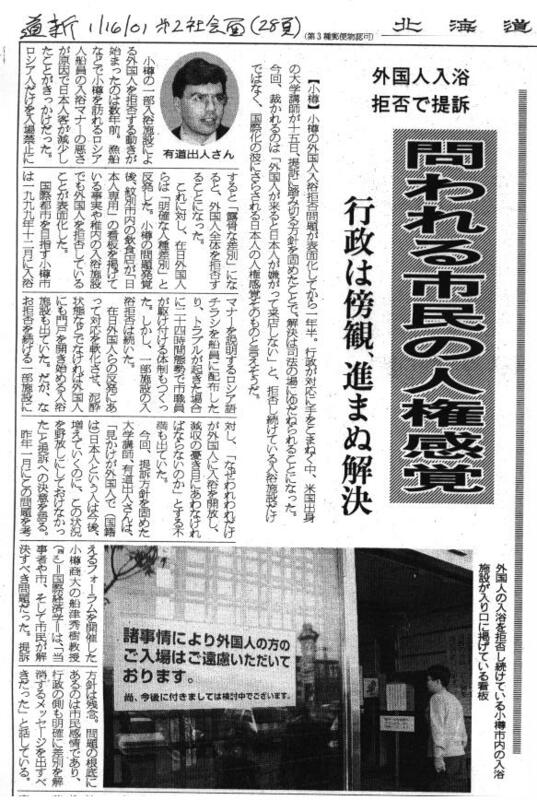 Jan 16: Our intent to bring a lawsuit against Yunohana Onsen leaked to the press, appearing first in Hokkaido Shinbun Jan 16 Choukan page one and page 28, (Japanese jpegs, English translation of both articles here). Jan 17: Yunohana Onsen, excluding all foreigners since it opened around three years ago, removes its exclusionary signs within 24 hours of the above Doshin articles. After our nearly sixteen months of fruitless negotiations with Yunohana, this of course was a surprise, but more surprising was Yunohana's putting up a different sign with four conditions for entry, applied to foreigners only. In brief, these are: 1) stay in Japan of over one year, 2) understanding of Japanese language, 3) understanding of Japanese bathing customers, 4) the will to follow the rules and not cause a problem for other customers. See Jan 17 Doshin article corroborating this development, the rules in detail and in the original Japanese, and Plaintiff Ken Sutherland's stance on this development. Jan 24: Otaru City updates their stance on the discrimination within their municipality on their website (Japanese link here, English translation by Plaintiff Ken Sutherland here). Jan 29: In a 4:30 pm phone conversation with Plaintiff Arudou Debito, Otaru City International Bureau Chief Takeuchi Kazuho acknowledges that the hyped "24-hour hotline", so that people with international problems can contact City Hall for mediation, is not in fact a public phone number. Off-hours, it is a collection of cellphone numbers, and only given to only two onsens--those with a history of discrimination (Panorama and Osupa; Defendant Yunohana refuses to participate)--because "our bureau cannot handle too many calls." The anticipation of ineffectualness consequently creates an ineffective system, in violation of Article Six of the CERD. 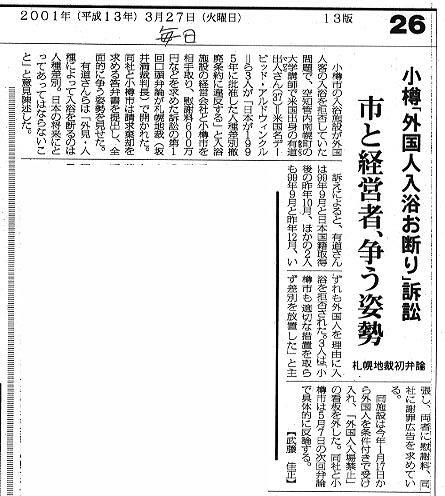 Jan 31: Arudou Debito appears in Mainichi Shinbun article (page 5) for giving a speech at Jan 30 Justice Ministry Division of Human Rights Deliberation Council meeting. Headline: "Japan is only [OECD] country without law against racial discrimination." (jinshu sabetsu teppaihou ga nai no wa nihon dake). 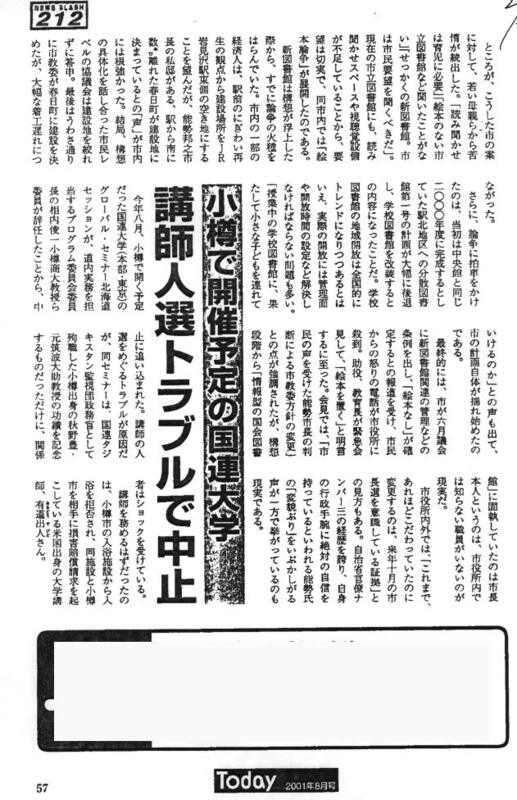 (Text of Arudou's handout to conference in Japanese here), Kyodo Wire Service article in Japanese here. 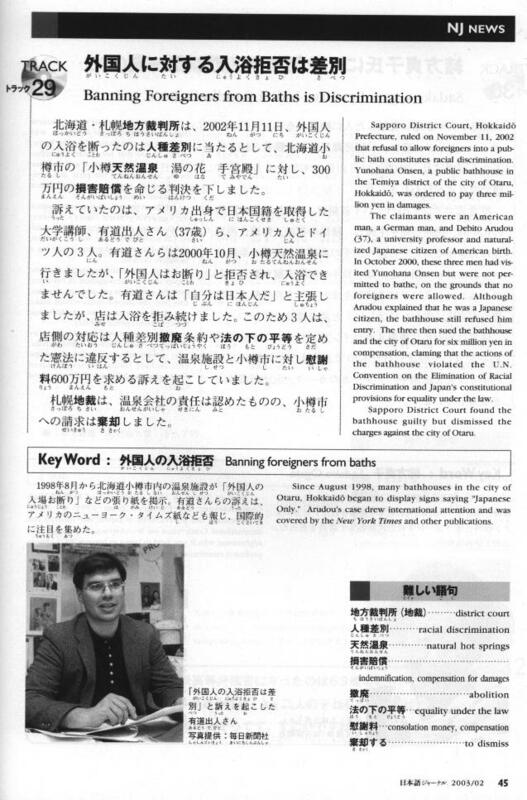 February: REPORT ("Country Reports on Human Rights Practices") updated annually from the US State Department (February 2001), on Japan and its overlooked discrimination. Feb 1-3: Submission and acceptance of our lawsuit documents at Sapporo District Court, Feb 1, 2:30 PM. The following 3PM press conference gets coverage from all Hokkaido TV networks (NHK, HBC, UHB, HTB, and TVH) in evening broadcasts, as well as TV Asahi, BBC, and others we didn't catch. On the following days, the print media publish their articles (Hokkaido Shinbun page one, page two, Asahi and its Evening News, Yomiuri (article one, article two) and its Daily Yomiuri, Mainichi and its Daily News, Jiji, Kyodo, Reuters, Japan Times, NY Times, and more). 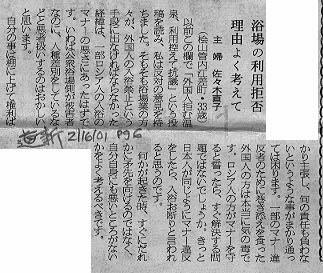 Feb 16: Hokkaido Shinbun Letter to the Editor by Hokkaido housewife says "the onsen is the victim here" demands that foreigners "take responsibility" for their actions. 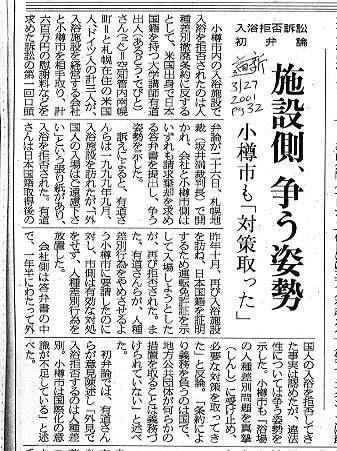 Angered wife of Arudou Debito writes response in Feb 23 Hokkaido Shinbun Letters demanding to know why victimized innocent people and their children have to take any responsibility. (Japanese) Apologies in private later come from the first housewife, stating that she meant that offending Russians should take responsibility for their actions, not foreigners in general. Mar 7: Japan Times Letter to the Editor expresses outrage at unchecked discrimination in Japan and support for our lawsuit. Mar 5-Mar 23: Arudou Debito negotiates with Minshutou Party leader and Hokkaido Representative Hatoyama Yukio's Sapporo office, proposing a meeting to discuss legislative possibilities. Request denied, due to the fact that, according to assistant Mr Okuno, we are in court and the party does not want to take sides. This despite Arudou's stressing the meeting is not about the case but about drafting an anti-racial-discrimination law, which legislators are honor-bound by international treaty to create. Read email correspondence in Japanese here. Mar 26, 1:30 PM: FIRST COURT HEARING (Koutou Benron), Sapporo District Court. Plaintiffs read statements (chinjutsusho) outlining their motives and positions to the court. Read our first REPORT on this event in English here, and our court statements in Japanese and English here. 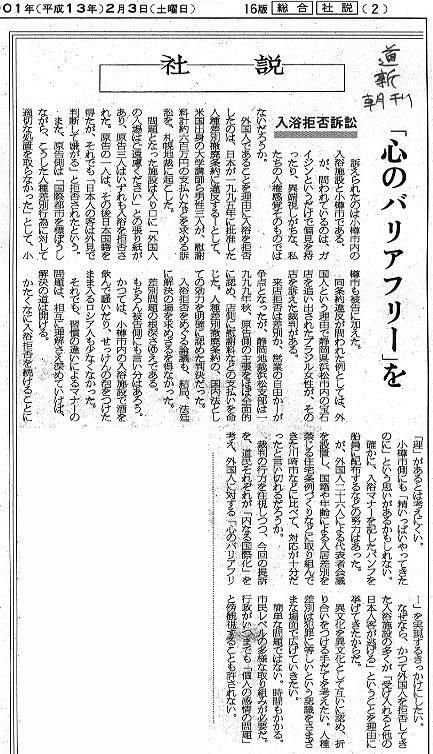 Article from Kyodo Wire Service in Japanese here. Mar 26, 8:30-9:00 PM: HBC Radio has thirty-minute program entitled "Japanese Only", showing how the issue is fermenting. Soundbites from many sides, including eldsters saying they don't want to bathe with foreigners because they stink and spread disease. To listen to the radio program in Japanese yourself in freely-downloadable Real Audio format, click here. Mar 27, 1:55-2:55 HBC TV does hourlong documentary on Lawsuit and Onsens Issue, similar in tone to the abovementioned Mar 26 radio program. April 16: Arudou Debito individually lobbies Sapporo branches of Japan's four major political parties (LDP, DPJ, JCP, and Koumeitou) in an attempt to get them to consider passing anti-racial-discrimination legislation. Reactions mixed, with DPJ (Minshutou) acting most positive, Koumeitou and JCP being noncommittal, and the LDP rep (a Hokkaido Assembly Rep) going so far to say that "Japan doesn't need laws" in front of TV cameras! Full report in English here. Submitted draft bill (courtesy Issho Kikaku) in Japanese here and in English here. May 3-5: Plaintiffs Olaf, Ken, and Debito take trip to Wakkanai and Monbetsu cities to survey discriminatory establishments with exclusionary signs. Although the trio are fortunately refused entry nowhere, Japanese language ability was required for entry, which still confuses the issue of comprehension with compliance. None of the establishments refused to remove their signs, either. 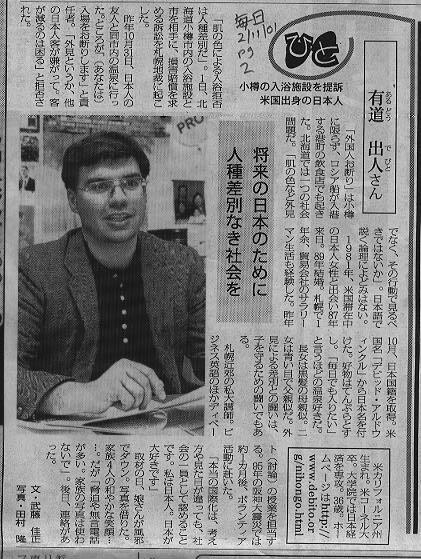 Read Japan Today Article (May 11, 2001) , a preliminary report (English and Japanese), a May 4 Wakkanai Doshin article (Japanese), and a Kyodo Wire Service blurb (Japanese). 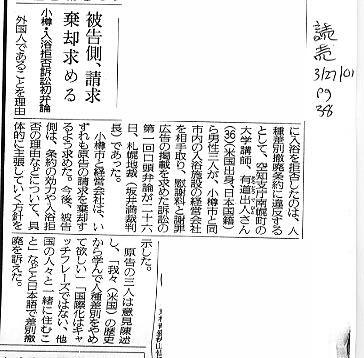 May 7: Second Court Hearing (Dai 2 Kai, Koutou Benron), Sapporo District Court, produces defense briefs from Defendants Onsen Yunohana and City of Otaru (Japanese). 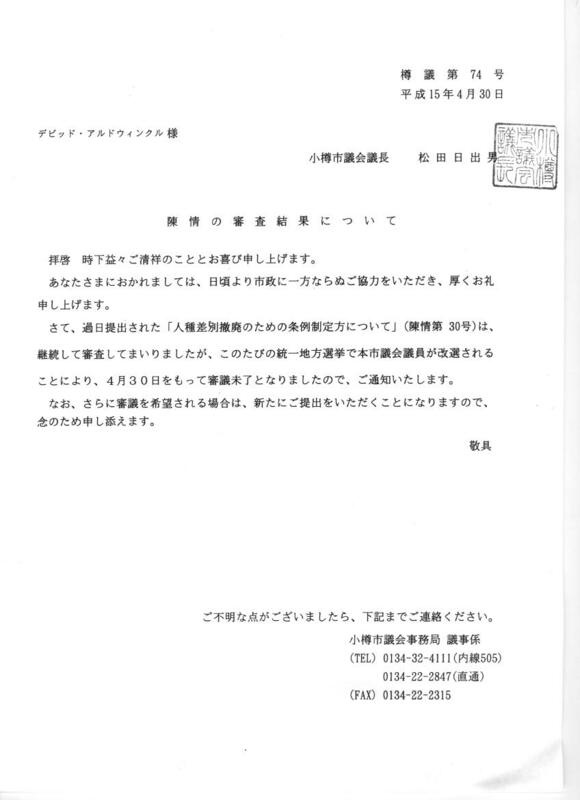 May 2-21: The United Nations University (Jingumae, Tokyo), which in January 2001 invited Arudou Debito to speak at an upcoming August human rights seminar, formally retracts its invitation due to problems with "finalizing the program". The real reason, according to the Programming Committee, is due to financial pressure from the Hokkaido Government and Doukeiren, which threatened to withdraw funding if Arudou were allowed to speak. UN University passed a resolution barring speakers who are in lawsuits from speaking about their case, in a breathtaking double-whammy--denying a plaintiff his freedom of speech while subordinating academic integrity to financial interests. Read all about it here. 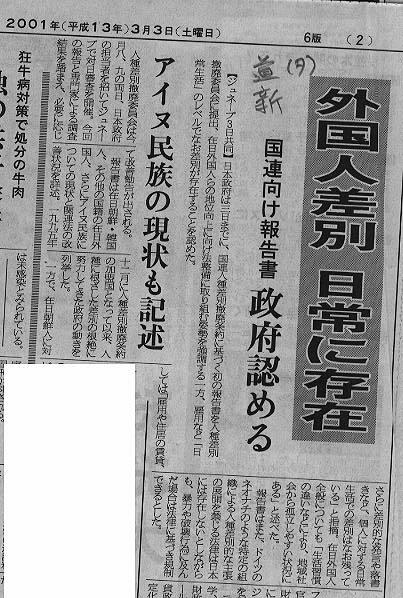 May 26: After collecting information over the winter months (where Arudou Debito spoke on Jan 31, 2001) Ministry of Justice Deliberation Council offers up it proposal for a Human Rights Commission, where advice and support for anti-discrimination lawsuits can be found. Asked for a comment, Arudou Debito responds, "It's a positive step. However, I worry about the effectiveness of the commission in terms of staffing and financing. Also, assistance in lawsuits is also no substitute for anti-discrimination legislation." Moreover, nowhere mentioned in the proposal is protection against discrimination by nationality. Click to read information site (mostly in Japanese, but with English brief). 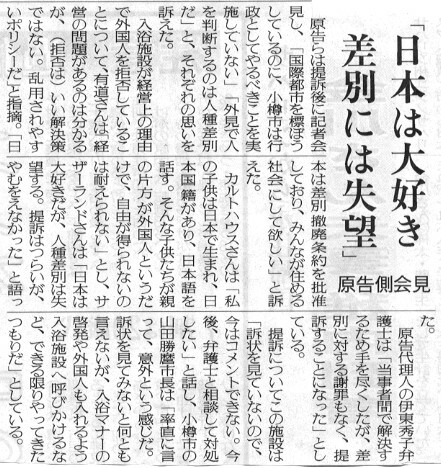 June 16: As per May 2 release above, Hokkaido Shinbun reports on United Nations University's cancelling its Otaru human rights seminar due to Arudou Debito being one of the panelists. UNU denies that it was under any pressure from its financial sponsors. Read more here. June 18: Third Court Hearing, 10:30 am, Sapporo District Court. Judge asks lawyer for Defendant Yunohana to find out whether his client has ever received any public monies in support, opening up the question as to whether Yunohana is a public facility or not. July 3: Otaru Onsen Case hits bookstores as part of book prologue, "Teppen Kaketaka", by Nanporo author Mr Ono Mitsutoshi. He opens by mentioning his friend in Nanporo who became a naturalized Japanese, and works to make Japan a more open place in the new century with a lawsuit against racial discriminators. Clearly the Otaru Onsen Case is influencing Japanese society in very interesting ways. The book jacket (containing ISBN, publisher, price and outline), as well as the first two pages of the prologue, are viewable in Japanese here. July 6: The Democratic Party of Japan (Minshutou) in Hokkaido publishes a flyer ("Minshutou Sapporo" Number 206) reporting on June 19's Forum for a human rights ordinance in Hokkaido. The full outline of the forum, representative attendees, and topics covered by the five panelists (Mr Aoki from Hokkaido Hemophiliacs Association, Ms Tahara from the Ainu Utari Kyoukai Association, Mr Suzuki from the Hokkaido Sexual Minority Association, Associate Professor Iwamoto from Hokusei Gakuen University, and yours truly) are all up in summary form in Japanese (with photos) here. July 8: Sapporo Ritsumeikan Keishou High School, one of the premier secondary educational institutions in Hokkaido and winner of 2001's National HS Speech Contest, holds their annual School Festival. Their International Club puts on a symposium on discrimination, human rights, and internationalization, and has Arudou Debito give a workshop on the topic. 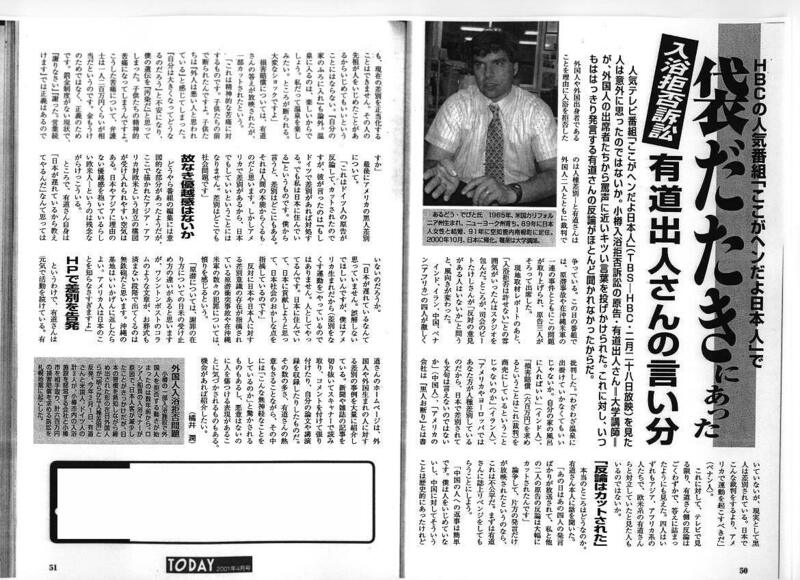 August: Doshin Today monthly newsmagazine has two-pager on UN University's May 2001 cancellation of its Otaru Human Rights Seminar, due to financial pressure from Hokkaido Government sponsors who wanted Arudou Debito's invitation to speak revoked. In Japanese page one and page two. August 27: Fourth Court Hearing, 10AM, Sapporo District Court. Plaintiffs answer Defendants claims of innocence. October 19-20: Hamamatsu City meets with twelve other mayors with high concentrations of foreign residents, establishes task force to address cross-cultural problems. October 22: Fifth Court Hearing, 10AM. Plaintiffs offer more documents supporting case. November 26: Sixth Court Hearing, 10AM. Final submission of documents. See them here in Japanese (nine pages). November 30: The City of Hamamatsu, in conjunction with twelve other nearby cities with large populations of non-Japanese, established in October 2001 a city-level task force to address cross-cultural issues. Hamamatsu's Mayor Kitawaki this day proposes to the national government several reforms on existing statutes concerning Education, Social Security, and Alien Registration, with a view to helping non-Japanese have a more secure, longer-term stay. This is quite a U-turn, since Hamamatsu is the site of the Ana Bortz Lawsuit and also has police issuing pamphlets profiling foreign crime. So if Hamamatsu can take positive measures, why can't Otaru? Full information here. 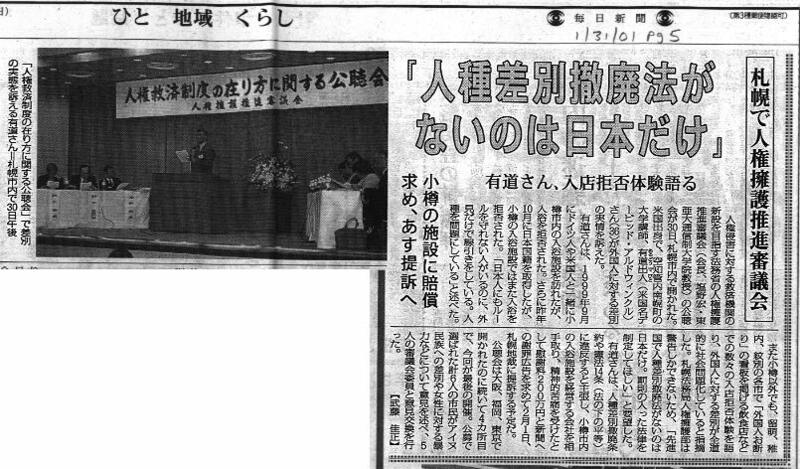 December 26: Arudou Debito holds press conference in Otaru City Hall Press Club, to draw attention to abovementioned Nov 30, 2001 Hamamatsu City push for non-Japanese residents. 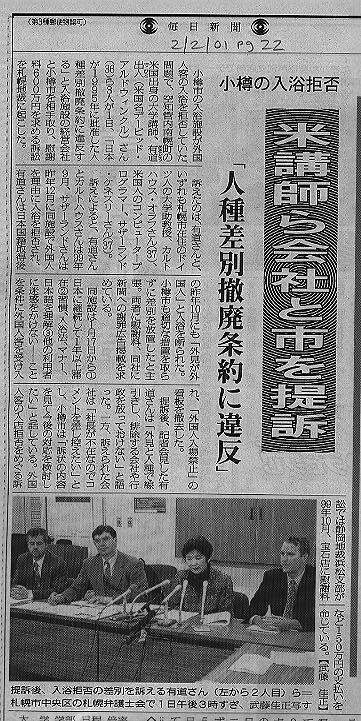 Gives information on "Hamamatsu Sengen" to Otaru City International Desk as an example of a more proactive stance, which Otaru has explicitly stated in court was not possible for a city to take. Full information here. January 12: Kyodo Tsushin runs 3000-word article on how a friendship between one onsen excluder (Osupa's Mr Ohkoshi) and one person excluded (Arudou Debito) could blossom. Appears in 40 regional papers (none in Hokkaido, alas). 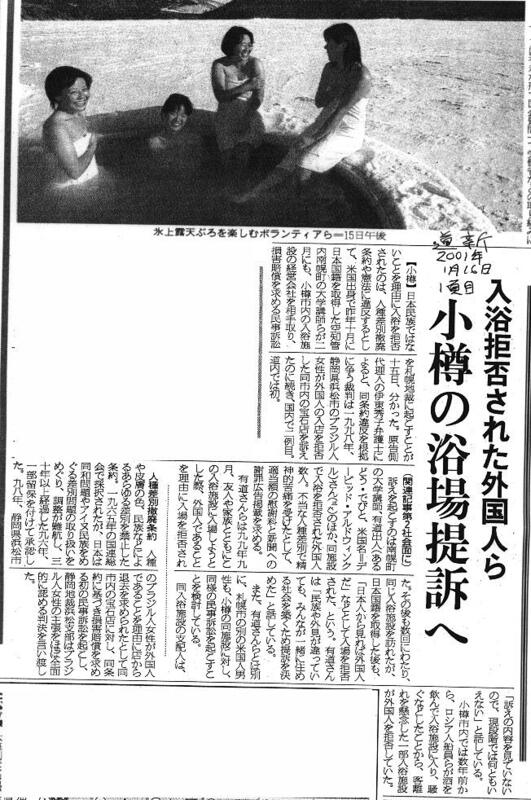 Full color photograph of Ohkoshi and Arudou in a bath together with Japanese article from Jan 21, 2002 Kumamoto Nichi Nichi Shinbun here. English translation of the article here. Plaintiffs Karthaus, Sutherland and Arudou give Oral Testimony with cross-examinations in Sapporo District Court. See rough transcript of their Oral Testimony, as well as official text of their newly-submitted Written Testimony from an information site here (English and Japanese). Mr KOBAYASHI Katsuyuki, Manager of Onsen Yunohana, testifies on behalf of Defendant Earthcure KK, stating for the record the exclusionary measures taken, the reasons why, and the ways in which the City of Otaru in his view refused help resolve the situation. Mr Kobayashi also makes clear that he supports the passage of a local anti-discrimination ordinance (chinjou), which Otaru City has for years refused to do. Mr TAKEUCHI Kazuho, contemporary Head of the Otaru City International Relations Desk, testifies on behalf of Defendant City of Otaru. In both examination and cross-examination, Mr Takeuchi makes clear what measures the Otaru City government refused to take (such as drafting an anti-discrimination ordinance), even consulting the Ministry of Justice's Bureau of Legal Affairs (Houmukyoku) to find out what it was not legally obligated to do. Even though Otaru City, he explicitly states, was aware of the problem as a matter of racial discrimination from 1993, it took insufficient measures against the problem for the better part of a decade--in clear violation of Article Two of the UN Convention on Racial Discrimination. 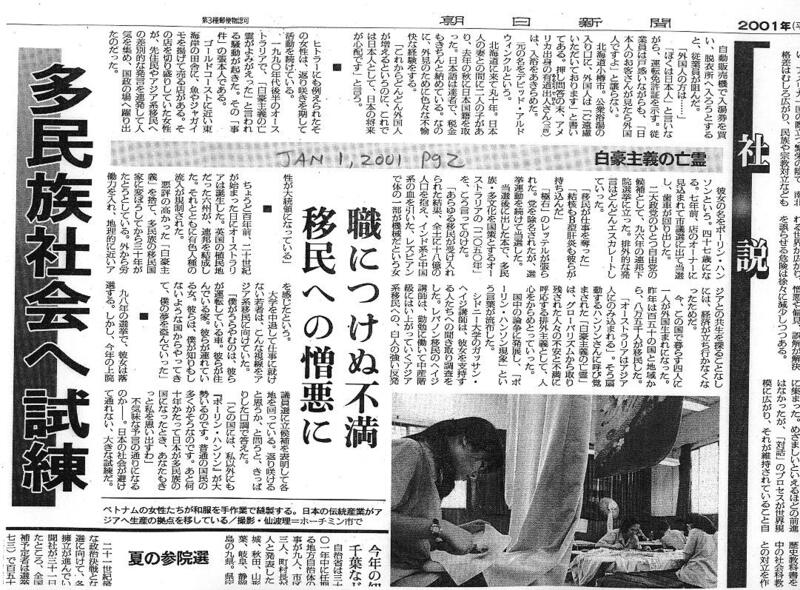 April 18: OTARU ONSEN OSUPA FORUM (a chat with elderly onsen bathers about their feelings about foreigners--an event which almost ended in disaster), featured in Japan Times, April 22, 2002, page 11, "Calm after Otaru Onsen Storm--Public forum finds birthplace no bar to a bath"
On May 14, 2002, Chief Judge Sakai stated that arriving at a court verdict (hanketsu) would be "difficult" (muzukashii), and put pressure on Plaintiffs to settle during the first Settlement Meeting (read REPORT here). 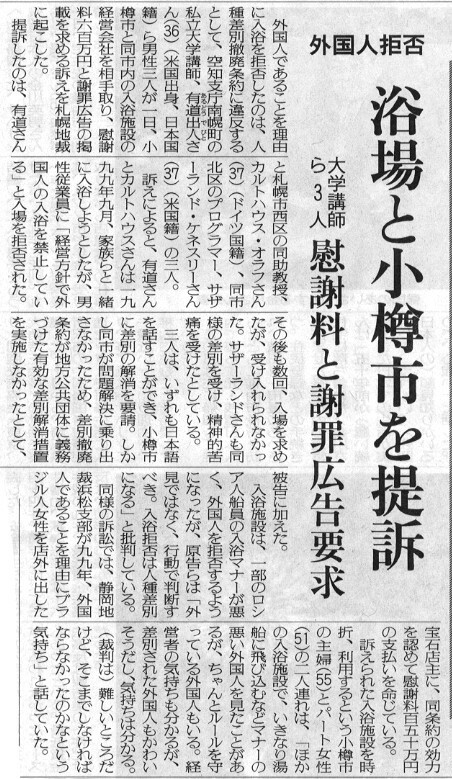 After Judge Sakai drew up a settlement offer dated May 31, 2002 (which, demanding apologies and compensation for ill-treatment of "foreigners", mysteriously forgets that one of the Plaintiffs is a Japanese citizen. It also omits any aspect of racial discrmination from this case--read REPORT here). Both Defendants and Plaintiffs refuse to settle in the second Settlement Meeting held on June 11, 2002. There is no choice now but for a decision to be delivered. There will be no out-of-court settlement. August 19, 2002: Final Hearing Held. Simple and final exchange of documents. 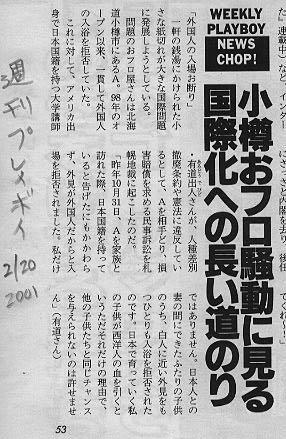 January 7, 2003: LAWSUIT SPLITS INTO TWO LAWSUITS: "THE OTARU CITY APPEAL" (Arudou Debito, one Plaintiff, vs City Hall) and "THE YUNOHANA APPEAL" (Onsen Yunohana's Appeal vs all three Plaintiffs). The Yunohana Appeal is represented by Lawyer Itou Hideko, same as before. 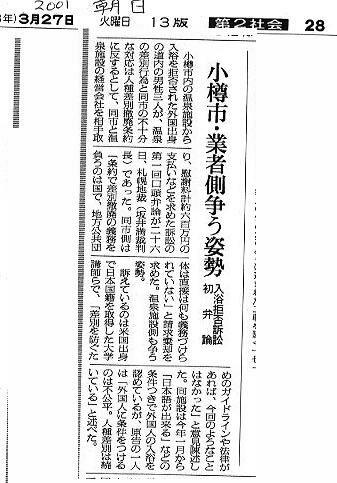 However, the Otaru City Appeal is being represented pro bono by the THE OTARU CITY RACIAL DISCRIMINATION "LAWSUIT BENGODAN" (LEGAL TEAM) (Japanese: ｶﾂ祟ﾚsﾆlﾚ壷碣賽iｶﾗﾔ凪c), a group of volunteer Core Lawyers, Advisors, and Supporters from around the world. REPORT on WHO WE ARE and WHAT YOU CAN DO TO HELP (Yes, you can join us if you like). 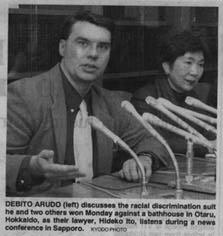 February 5, 2003: SUBMITTING YOUR EXPERIENCES OF REFUSALS ON THE BASIS OF RACE OR NATIONALITY TO THE SAPPORO HIGH COURT in what is probably Japan's first class-action lawsuit on behalf of non-Japanese and racially-diverse Japanese. Please help out if you can. 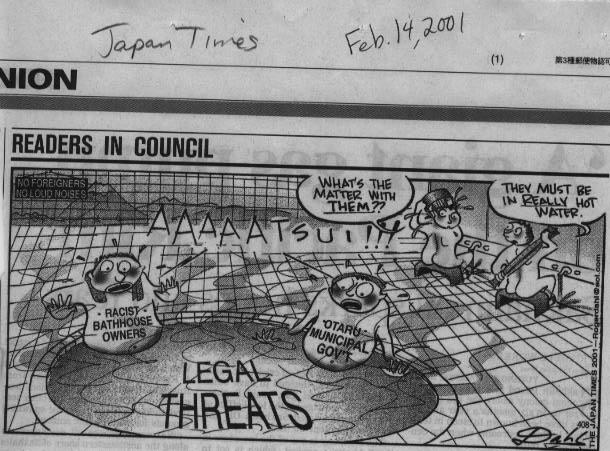 April 30, 2003: The Otaru City Assembly notifies us that the Anti-Discrimination Ordinance we submitted on January 13, 2000, has died in committee. See NOTIFICATION FROM OTARU CITY GOVERNMENT (Japanese jpg) We are requested to resubmit, which we will do in Winter 2004. May-June 2003. The split into TWO APPEALS becomes clearer (click to page up to more information on this). First hearing on both Appeals June 3, 2003, Sapporo High Court. Report here. July 4, 2003. The Washington Post, Style Section, Front Page, entitled "IN JAPAN, US EXPAT FIGHTS THE YANKEE WAY"
August 9, 2003. Arudou Debito speaks on "Gender and Human Rights" in a research forum sponsored by the Active Women's Network (AWN), at Tomakomai City Women's Center. Topic: "On Alleviating Domestic Discrimination: How Discrimination by Gender and Race is being Legally Justified in Japan" Subtitle: "There is a concrete concept in Japan of 'Rational Discrimination' (gouriteki sabetsu), with the underlying premise being, 'discrimination is a natural part of human interaction, and is thus to some degree unavoidable', like background radiation. The problem is that this concept is ill-defined enough to be used to justify discrimination, or at least the lack of safeguards against it, even in Japan's judicial system. 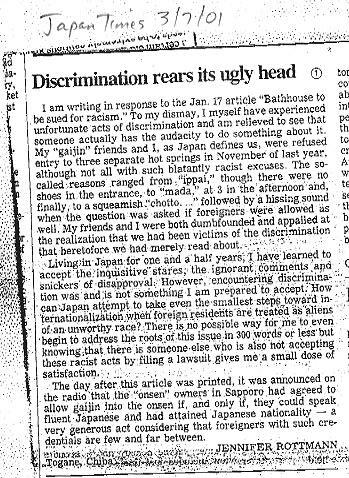 As was seen in the Otaru Onsen Lawsuit court decision handed down Nov 2002, refusal of customers by race was not ruled illegal as "racial discrimination", but rather as "unrational discrimination", i.e. "traversing the limits of socially-acceptible discrimination" --whatever those perpetually-undefined limits may be. This talk will discuss how this conceptual process interferes with the alleviation and abolition of other forms of discrimination in Japan as well." on the implications of unfettered discrimination on the Otaru citizenry and Japanese society. on the implications of the Otaru Case past, present, and future. Sept 4, 2003: SECOND HEARING FOR OTARU APPEALS. STATEMENTS READ ALOUD IN AND SUBMITTED TO COURT INFORMATION SITE WITH TEXT OF STATEMENTS HERE, and other documents submitted as evidence to the Court in Japanese. 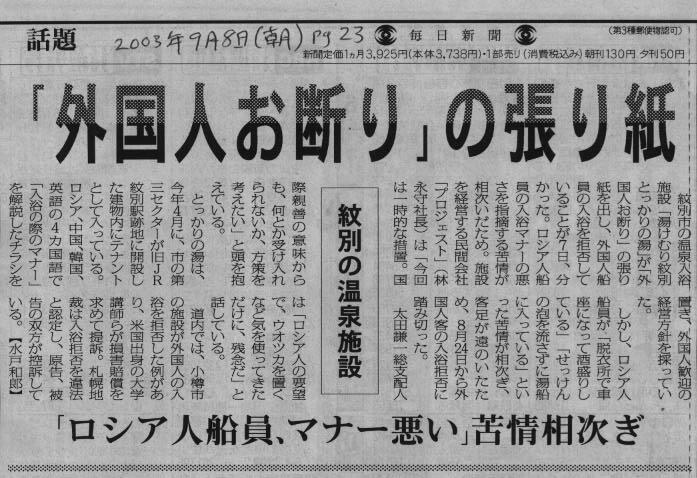 Sept 8, 2003: The media reports another place in Monbetsu City, Hokkaido, starts refusing foreigners (or rather, "people from foreign ships" (gaikoku senjou kumiin) from August 2003. The "Yukemuri Monbetsu Tokkari no Yu" bathhouse, opened April 2003 as a public-private sector hybrid (dai-san sector) claims Russian sailors have been making a mess and decides to ban their entry. It joins the ranks of party area Hamanasu Shoutengai and bathhouse Monbetsu Onsen (behind Monbetsu Prince Hotel), which have been refusing all foreigners with "Japanese Only Store" signs ("nihonjin senyou ten", in Russian) and policies unabated since 2000, despite government warnings and negative publicity. 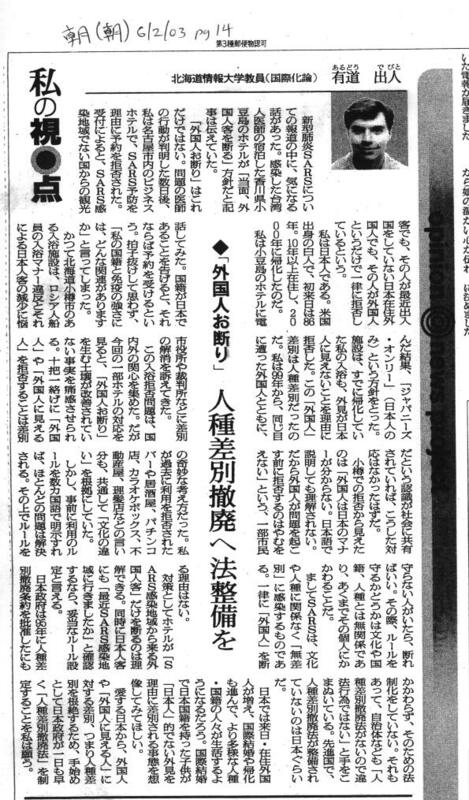 Click to see Hokkaido Shinbun and Mainichi Shinbun articles in Japanese. 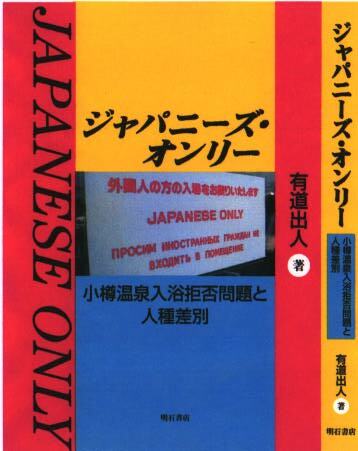 October 2003: The ROGUES' GALLERY, a website with names, addresses, phone numbers, and photos of enterprises with "JAPANESE ONLY" signs is established, to show that these cases of exclusionism are not isolated incidents. They are part of a nationwide and growing trend. Submissions welcome. Nov 6, 2003: THIRD HEARING FOR OTARU APPEALS. Brief report for the time being here. Nov 15, 2003: Karthaus and Arudou visit MONBETSU again find JAPANESE ONLY signs are still up and will not come down. INFORMATION SITE WITH NAMES, DATES, PLACES, PHOTOS AND ARTICLES HERE. Jan 27, 2004: FOURTH HEARING FOR OTARU APPEALS: BRIEF: Surprise: the judge said that our request to divide the two appeals (my appeal against the City, onsen Yunohana's appeal against us) would be granted. Further hearings for the Yunohana part of this courtroom drama finished and Yunohana vs Plaintiffs lawyers were excused. Judges then decided that the next hearing, March 16, will have spoken testimony from one of our affidavit submitters, Prof Munesue, Faculty of Law at Seijou University. Dr Munesue will be cross-examined about the Japanese government's responsibility under international law and treaty. Looks like judges they are actually taking this case seriously--enough to get a second opinion from outside. The decision itself, due sometime this century, will not be separate, however, as I had hoped. But hopefully, with this development, there will be more discussion within the ruling on the responsibility of local governments to eliminate discrimination. 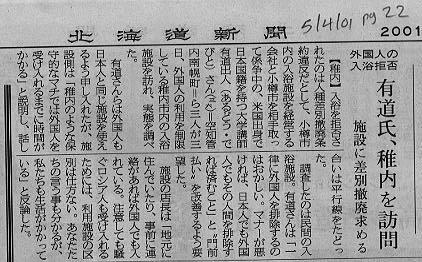 May 13, 2004, BRIEF ON SIXTH HIGH COURT HEARING, with statement of opinion made to High Court by Arudou Debito in English and Japanese. June 24, 2004, Seventh High Court Hearing was carried out with nothing new to report. Fabricates information to make his point, then refuses to retract or correct his assertions. Information site here with full details on misquotes from a 2000 USA Today article, with requests for correction by article author, reporter Peter Hadfield. Next steps: The United Nations (as UN committees will not hear cases until all domestic avenues are exhausted, which they now are), and a new lawsuit against the national government (as opposed to a local government) within the year. The main character is one of those fashionable young ladies called "ganguro" ("black face"), who bleach their hair, darken their faces and put white lipstick and eyeshadow in a nearly photo-negative contrast to previous Japanese fashions. The point is that they don't appear Japanese. She is standing outside a bathhouse (the hanging sail has the hiragana for "yu", symbolizing "hot water".) You can see she has a passport. Her caption: "I'm a Japanese!" The point: Standards of Japanese appearance have changed, so outward appearances might deceive enough even to fall under exclusionary standards. 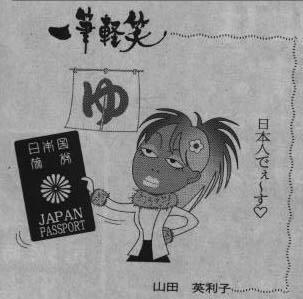 Though the irony and the humor might make that seem impossible, we will add the point that our children, who don't "look Japanese" in some people's eyes, would have to bear passports too just to take a bath when they get older. This is not ironic. This is just wrong. Policies excluding by outward appearance have no future in an internationalizing and genetically diversifying Japan. Speaks very well for itself. Questions? Comments? Email Plaintiffs Arudou Debito/Dave Aldwinckle, Olaf Karthaus, and Ken Sutherland here.